Are you looking for a reliable skip hire in Brisbane? Why choose Clean Up Skip Bins? Clean Up Skip Bins is the premium skip hire provider servicing the entire region of Brisbane, Queensland. Commercial, industrial, building sites or residential clean ups – we have a solution for all our customers in need of Brisbane skip bins or rubbish removals. Whether it’s small or large building or construction sites, garage and shed clean outs, rental property clean ups, renovations, yard and garden clean ups, deceased estate and concrete cartage – we have a bin to suit every situation. We do skip deliveries right to your door, as well as Brisbane waste and mattress removal. 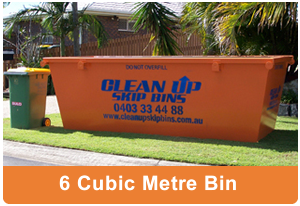 For affordable and reliable Brisbane skip bin hire, Cleanup Skip Bins is the obvious choice. Our expert team can look after all your needs, ranging from removal of waste and debris to a full clean up. 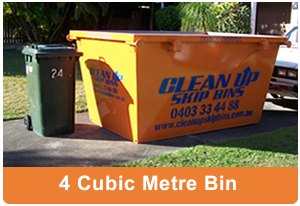 At Clean Up Skip Bins Brisbane we can meet all your commercial and residential waste removal needs. We have a variety of quality skip bins in 4 and 6 cubic metre sizes, with the option of 8, 10 and 12 cubic metre combinations. When you organise a Brisbane Clean Up Skip Bin we guarantee quality service and support along with a promise that we will be there when we say we will. This means you can get on with the business of cleaning up. Our Clean Up Skip Bins are perfect for all your rubbish removal, including; general waste (household rubbish and commercial waste), clean fill (soil, clay, ceramic tiles, concrete, bricks and rocks) and green waste (general green organic wastes, grass and trimmings). With competitive prices and reliable service Clean Up Skip Bins make your commercial or residential clean up as easy as possible. We believe in customer satisfaction and deliver skip bins to your desired location. Our rubbish removal skip bins find their applications small and large building or construction sites, garage and shed clean outs, rental property clean ups, yard and garden clean ups, deceased estate and concrete cartage.